Billy Joe Saunders 27-0 (13) has called for WBO super middleweight champion Gilberto Ramirez 40-0 (26) to face him or vacate his championship belt. The 29-year-old British southpaw is in camp to face Shefat Isufi 27-3-2 (20) at Lamex Stadium in Stevenage, UK on May 18 for the interim WBO 168-pound title. Ramirez made his light heavyweight debut against Tommy Karpency on the weekend, stopping him in four rounds. “I am raring to go for Ramirez,” Saunders said to ESPN. “If he doesn’t want to face me, then give up the title and let me fight for the full championship. If it’s not going to happen against me after my interim title fight, then I would rather him say, now. “He has said he can make 12 stone for Callum Smith, so I don’t see the problem with myself. If he can make 12 stone for Callum, he can make 12 stone for me. 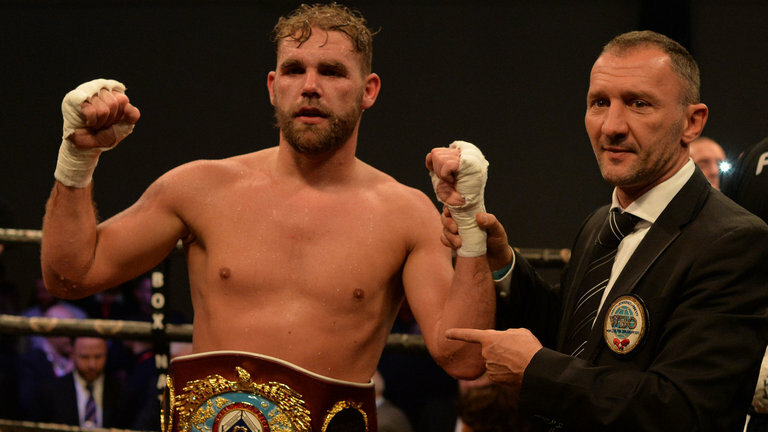 Saunders says the fight would be easy to make with Ramirez’s promoter Top Rank enjoying a strong working relationship with Saunders’ representatives Frank Warren and MTK Global. “His promoter, Bob Arum, has a good working relationship with Frank Warren and MTK, and he has most probably had a conversation with Ramirez,” Saunders added. “Personally, myself, I don’t think Ramirez will go ducking anybody, but unless he 100 percent knows he’s good at the weight, I can’t see him taking the chance of fighting me.